Having a set of sparkling white teeth contributes to a beautiful, fabulous look. 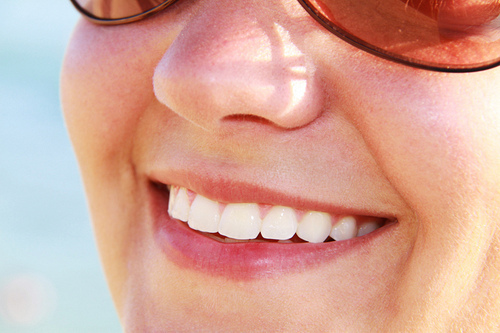 White teeth enhance the beauty of your smile and give the impression of youth, hygiene, and good oral health. While not everyone is naturally blessed with white teeth, you can have that dazzling set of pearly whites with teeth whitening in Maryville, TN! Dr. Kim C. Norman will show you how this could happen and how a beautiful, bright smile is possible with teeth whitening. Our numerous happy patients are proof that teeth whitening really works to give you a noticeably whiter smile than before. • White teeth look good for people of any age. • You look younger and fresher with white teeth. • White teeth look neat and clean, looking absolutely pristine for your smile. • White teeth can give you an instant smile makeover even with no makeup on. • Looking great with white teeth enhances your confidence and self-esteem. How Can Whiter Teeth Be Possible? We, at Dr. Kim C. Norman’s dental practice, can give you whiter teeth, by up to 7 shades lighter than before. Our whitening system is very effective; unsightly and yellowish stains and discoloration can be removed. Our practice offers both in-office and at-home treatments to whiten the teeth effectively. You can avail yourself of one of the two treatments or use a combination of both for dramatically white results. For the in-office treatment, Dr. Norman will apply a peroxide-based gel on your teeth, and use this in combination with a special light to speed up the whitening process. Dr. Norman covers the lips and gums during the whitening process, so your mouth won’t experience sensitivity. You can follow up your in-office treatment with at-home whitening kits, to maintain the whiteness of your teeth. The kit comes with a bleaching tray containing a special bleaching agent. You will wear this tray independently at home so that stains and discoloration are prevented from settling deep within the teeth. When used in combination, both our in-office and at-home treatments can give you dramatically white teeth, the kind that can make heads turn when you flash your beautiful, white smile. Need an instant smile transformation today? Get it with Dr. Kim C. Norman’s teeth whitening in Maryville, TN! The process is fast, simple, and very effective. With teeth whitening, you can smile and speak with renewed confidence; thus, bringing out the best in your character and personality. Teeth whitening enhances, beautifies, and transforms your life for the better. Call us today at (865) 982-9662 to schedule your initial consultation with Dr. Norman.